The Simple Pin podcast launched in May of 2016 and it’s been steadily growing ever since thanks to all of you. It’s been such a delightful experience interviewing guests and hearing how they are maximizing their Pinterest efforts. I’m learning right along with you! Looking back over 2016, I pulled together all the top episodes based on a few factors — number of downloads, feedback from you, the reader and value of teaching. These podcasts were not only to help you, but to help me and my team as well. We always want to be on top of Pinterest trends, so if I can gather up those who are making an impact, we all get to learn together. Summary: Cassie has been continually strategic about increasing her Amazon sales through Amazon link and ad placements as well as being helpful to her readers. As someone who lives far away from large retailers, Amazon has become a staple in her life. She knows some of her readers may be in the same position. Therefore, she wants to provide the easiest way to purchase the products necessary to complete the recipe or project. Why I chose it: Pinterest is only one piece of the marketing puzzle. It’s essential that you have certain blog elements in place to make money and serve your audience. Cassie makes this process look effortless. I’ve heard from many of you that the plug in she talks about in the podcast has helped many of you boost your Amazon sales as well. Since Amazon is one of the largest affiliates I think it’s important that you all master this method as one part of your monetization process. Summary: Everyone wants to know about how to maximize SEO on Pinterest. Since Google will index pins, boards and profiles it’s important that your SEO strategy is fine tuned. Kimberly walked us through the main areas where we can maximize our efforts by using keywords on Pinterest. Why I chose it: It’s a very through training post starting from ‘What is SEO?’ into how to implement the tips. There’s also a handy checklist for incorporating keywords so you don’t forget. She also included some helpful reminders for getting your pins to rank higher. Something even I forget sometimes. Summary: Angela is the master at gift guides. We had worked together for two years on creating targeted guides for the Frugal Living NW audience. I knew Angela had tons to share so I brought her on to break down her exact strategy from creating them to posting. Why I chose it: First, Angela and I recorded it on a whim super late at night. We were laughing through most of it which made it a really fun episode to record. I got so much feedback about how comfortable it was to listen to, as well as inspiring, that I’m trying to talk Angela into co-hosting some episodes with me. It also sparked a fabulous discussion in my Facebook group that carried on from Thanksgiving to the first week in December. This post is SO packed with tips that you can revisit it all year long when you have to create a gift guide. Summary: Leslie talks about the key factors in monetization. He went well beyond the basic post and into resources pages and showing yourself to be a helpful resource. We also touched a bit on the comparison game of blogging and how to avoid that trap. Why I chose it: Leslie has been my business coach for two years now. I’ve learned so much from him about thinking outside the box and hustling when needed. His perspective was something I knew that my listeners needed to hear. While we didn’t talk a ton about Pinterest, his advice was solid and definitely business building. Summary: There are a ton of posts out there about how to grow your email list using ‘one simple trick’. I wanted to move away from that and show someone that has been hustling and working to grow her email list by trying all the tricks. And someone who could give us realistic numbers. Angela walks through her process of adding in sign up boxes and how her numbers grew as a results. Heads up, here are no mentions of anything about growing your email list by ‘1K in a day’. Why I chose it: It’s realistic. It’s what all of us struggle to do and we just need to hear from someone else who is struggling with the same thing. It’s taken a lot of work to grow my email for Simple Pin and I’ve done it all. I want people listening to have hope that their list will grow instead of feeling defeated. Angela helped to communicate that. Plus, we always have a good time chatting. See, co-host, right? 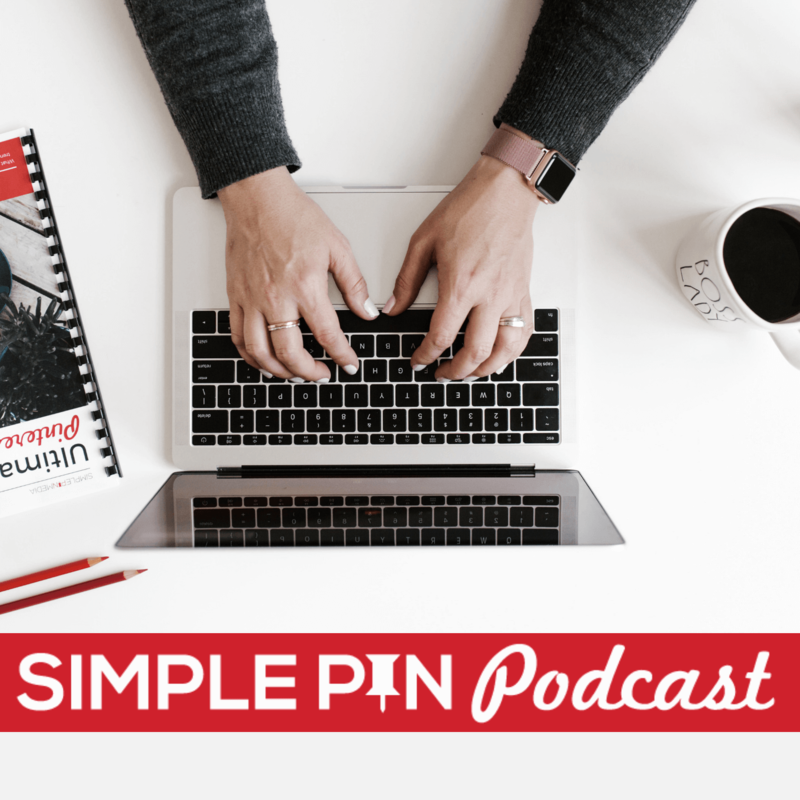 I hope you enjoy these podcasts and learn more about how to market your business on Pinterest as well as grow your business. We’ve seen a lot of changes over the last year that have made marketing on Pinterest tough and confusing at times, but I’m ready to tackle 2017 and all it has to offer. Will you join me? Download the 2017 Pinterest planner now so you’re ready. Glad to read your informative post – you always comes with beneficial tips to boost our earning. Today podcasts are really a good source to aware people regarding business mechanisms. Social media has always high impact on SEO, we need to only implement it wisely for better consequences. Eventually, thanks for sharing your valuable experience with us. Thanks for including our podcast together in your top 2016 selection! Honored 😀 and I hope it continues to help Pinterest business users for a long time to come. SEO is super powerful and I’m so happy that we could bring it to more people together.